You all should be extremely proud of your efforts, WOW what a stand, give yourselves a pat on the back... The stand looked amazing..
And the Elusive Holy Grail? The much Coveted "Best Club Stand at the Show"....?? Thank you Steve. Glad our internet connection is quick with that many photos. It does start now, after I swapped the carbs (and made up a longer choke cable to go with the slightly different carbs). What a fantastic effort! After seeing that I'm ALMOST tempted to move back to the UK to join in the scene. You have all done the Bimota brother/sisterhood proud; and I bet if the factory were watching it might have brought a tear to their eyes. It appears you forgot something in Sydney, why didn't we have a few additions to drape over our Bims? As for you Brits, I think that is sacrilege to use that magnificent SB4 as a bloody picnic table. British afficiandos, can you pick the other vary rare Biota out of the Sydney line up? For all persons who's bikes attended the Show...here are a few alternatives of the winning "Best Club Display" Plaque that can be printed off A5 actual size, and mounted in a frame or on a piece of MDF....Pop down to your local £PoundLand shop...pick up a batch of photographic paper and a picture frame and you're all done....it may cost you slightly more than it did the organisers to buy their versions handed out...but chances are it will look better and not have a chunk missing in the right hand corner....evidently for authenticity, you can just whack the bottom RHS corner with a heavy blunt object...be sure to remove the glass plate first though folks...Safety first. ..
Link not working for me at the mo but I'll check later. Some lovely bikes on their stand and the winning RGV4 was in the van next to mine outside so I added my congrats as he loaded up; lovely detail work! Just a quick note to say 'Thank you' to all the forum members for the signed print for my Dad. I've sent him a photo of the framed print, as he's a silent forum member and has let me bring some of his bikes along with some of mine to the shows. The next parcel that is sent to him will have the print enclosed. 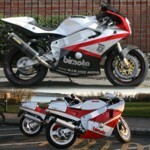 Also, a big thank you to Steve for organising everything and the Bimota bin, etc. And the Wine? Cup? Poster?...and the "runner-up" prize award?..>Thinking on...you really did have a full on "Generation Game"...you only forgot the Cuddly Toy didn't you?? ?